File photos The B-17F Memphis Belle first arrived at the National Museum of the United States Air Force in 2005. A restoration team has been working to complete the project, which is nearing completion, ever since. 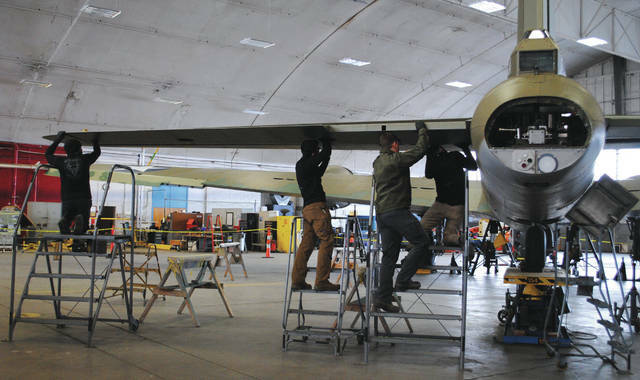 WRIGHT-PATTERSON AIR FORCE BASE — Two B-17G Flying Fortresses and more than 130 reenactors are scheduled to take part in the opening events for the B-17 Memphis Belle exhibit at the National Museum of the U.S. Air Force, scheduled for Thursday, May 17 through Saturday, May 19. The B-17F Memphis Belle – the first U.S. Army Air Forces heavy bomber to return to the United States after completing 25 combat missions over occupied Europe – and surrounding strategic bombardment exhibit will be unveiled to the public following a ribbon cutting ceremony on the morning of May 17 — exactly 75 years after its crew finished their last mission in the war against Nazi Germany on May 17, 1943. Visitors will also be able to experience the sights and sounds of World War II as more than 130 reenactors from around the country bring history to life by performing war-time skits, showcasing their displays and interacting with the public in an encampment near the museum’s 8th Air Force Control Tower from 9 a.m.-4 p.m. May 17-19 each day. On Friday, May 18, a special outdoor Big Band concert featuring Glenn Miller music will be performed by Air Force Bands from 6-7:30 p.m., near the 8th Air Force Control Tower. The concert is free and no tickets are required. Visitors are encouraged to bring their own lawn chairs or blankets, and hard surfaces are available for wheelchairs. In addition, the Air Force Museum Foundation’s Living History Film Series will present the 1944 William Wyler documentary film, “The Memphis Belle: A Story of a Flying Fortress,” which contains actual combat footage, in the Air Force Museum Theatre at 6:30 p.m. Thursday, May. On Sat. May 19, the 1990 film “Memphis Belle” will be shown at 4:30 p.m. in the Air Force Museum Theatre. Wyler’s daughter Catherine, who produced the 1990 film, will be at guest speaker and take questions from the audience at both films, along with Chris Henry of the EAA Aviation Museum, who will speak about what life was like aboard the famous Flying Fortress in the war, and the bond that exists between the people and the machine. Tickets for these films will be available on March 26 at www.afmuseum.com/livinghistory. Also during the event, authors Graham Simons and Harry Friedman will be signing copies of their book, “Memphis Belle: Dispelling the Myths” in the WWII Gallery. Simons will also will be signing his book “Images of War” in the Museum Store. Finally, author Steve Snyder will be available to sign copies of his book, “Shot Down” in the store on May 17.
https://www.fairborndailyherald.com/wp-content/uploads/sites/50/2018/03/web1_belle1.jpgFile photos The B-17F Memphis Belle first arrived at the National Museum of the United States Air Force in 2005. A restoration team has been working to complete the project, which is nearing completion, ever since. 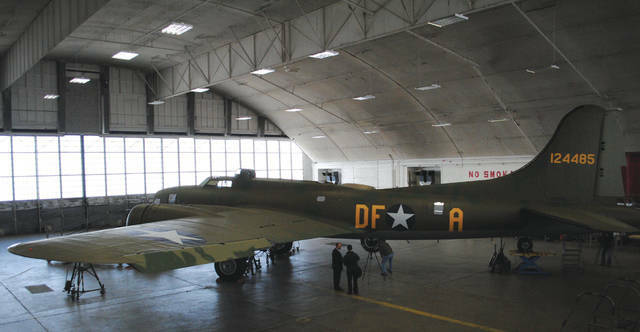 https://www.fairborndailyherald.com/wp-content/uploads/sites/50/2018/03/web1_belle4.jpgFile photos The B-17F Memphis Belle first arrived at the National Museum of the United States Air Force in 2005. A restoration team has been working to complete the project, which is nearing completion, ever since.